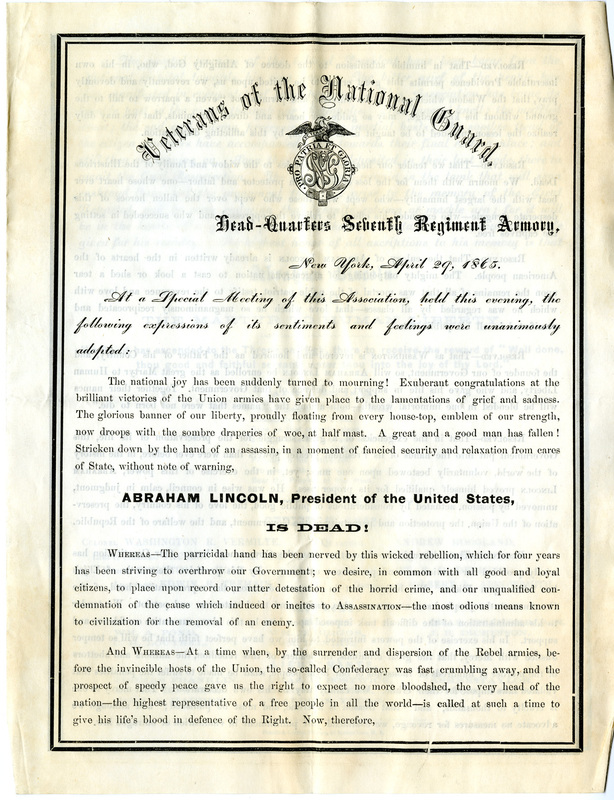 An April 29th, 1865 circular regarding the death of Abraham Lincoln by the National Guard. The National Guard pledges support to the Union and evokes the image of Abraham Lincoln as a martyr to human liberty who fought to uphold the government. Praises Andrew Johnson as the next Executive of State for his attributes of patriotism and loyalty to the Union. Use of this item for research, teaching and private study is permitted with proper citation and attribution to the Connecticut Historical Society. Reproduction of this item for publication, broadcast or commercial use requires permission. For permission, please contact the Connecticut Historical Society. chs.org/research/digital-reproduction.